Quick, packed with veggies, and kid-approved, these weeknight meals give you back time you can spend with your family—without any fuss about what’s for dinner. Kids won’t touch the broccoli on their plates? Next time incorporate flavorful roasted broccoli into their favorite Barilla Creamy Alfredo sauce. It not only delivers extra nutrition in a familiar form but also ensures you won’t hear any protests about “those vegetables.” Try pairing the sauce with kid-friendly shapes like Penne or Rotini. Add your family’s favorite veggies to this easy weeknight meal to make the dish go farther in both satisfaction and servings. The flavorful Traditional Basil Pesto sauce will entice even the pickiest eaters to dig into their dinner! Sweet potato in tomato sauce? You bet! This veggie’s subtle flavor and natural creaminess pair perfectly with Barilla Tomato & Basil sauce. Plus, this modern take on mac and cheese serves up quickly for dinner. Trust us: You can easily get away with adding 4 cups of diced vegetables—including onion, yellow squash, sweet potato, and mushrooms—to Barilla Meat sauce while giving your family the classic flavor they crave. Try the sauce in your favorite lasagna recipe for double thumbs up at the dinner table. Blending butternut squash into Barilla Spicy Marinara sauce is the key to this creamy and comforting slow cooker dinner. And with extra doses of vitamin A, vitamin C and fiber, you—and your kids—will love everything about this nourishing meal. Does adding veggies to the dinner table evoke a chorus of complaints? Give your children the nutrition they need in a less obvious way: Add a pound of diced zucchini to their favorite pasta, with Barilla Marinara sauce. If you’re out of zucchini, try this recipe with yellow squash, asparagus, or broccoli instead. Sliced mushrooms are a simple veggie addition that makes this pasta dinner rich and flavorful. 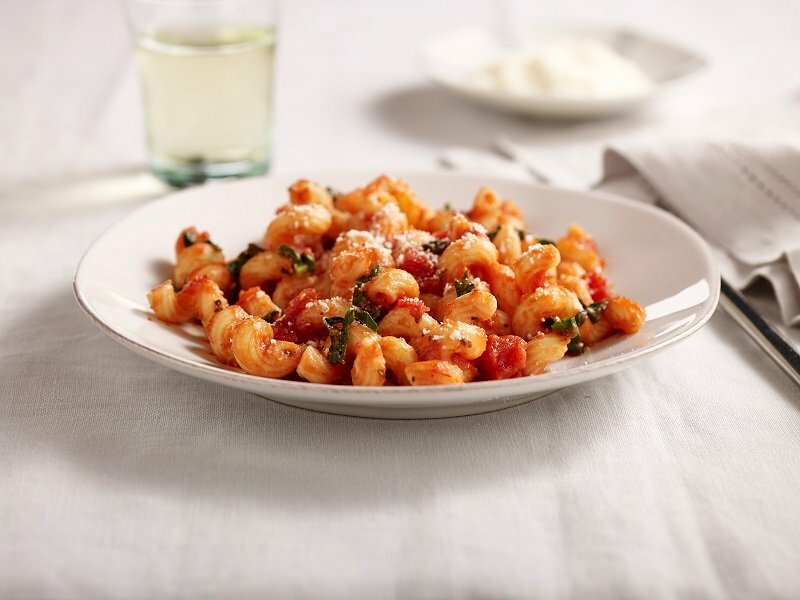 All you need are Barilla Marinara sauce, Barilla Rigatoni, and chopped fresh basil for an easy dose of greens.